Frank is showing at the Sydney Film Festival. You can grab your tickets here. Lenny Abrahamson’s What Richard Did was a dark, unassuming film whose impact relied on a combination of not knowing what to expect despite knowing the plot, Jack Raynor’s fine performance that included vulnerability and a remarkably universal take on issues of violence in young men, and its overall understated aesthetic that worked dramatic tension like a finely tuned instrument. It is one of those films you don’t realise you’re going to love until it catches you by surprise. 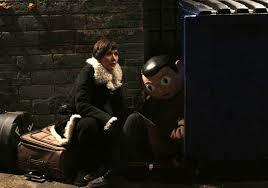 Two years later, Abrahamson comes out with the film Frank, dedicated to Chris Sievey, loosely based on the Frank Sidebottom character created by Sievey, and it is a dramatic change of pace, which isn’t a bad thing, only this film – and I really hate this overused phrase – can’t work out what it wants to be, and therefore runs the risk of offending a lot of the very people it is hoping to compliment. It’s quirky and unassuming enough to appeal to an indie style of audience, but a homage to outsider art it aint, and I’d hazard a guess that many Sievey fans won’t be too impressed; granted that’s not a huge number of people, but Frank probably could have done without the dedication, because without actually basing it on Sievey in any way, the dedication looks a little tacked on to justify stealing the idea of Frank Sidebottom’s head. I’m just sayin’. 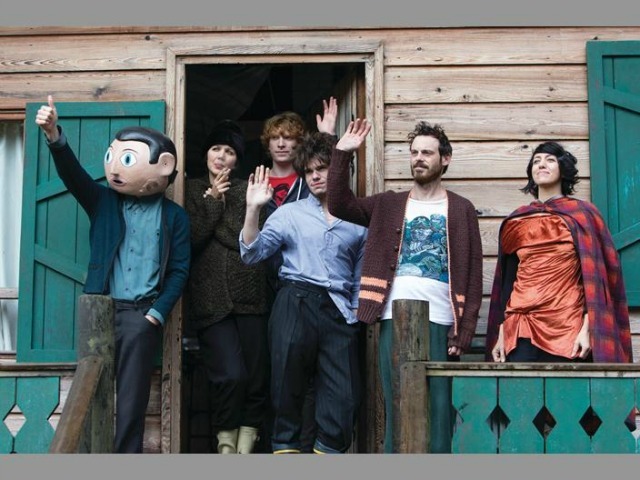 Frank is the story of an outsider band that lose their keyboards player and invite Jon (Domhnall Gleeson) to perform in his place. It turns out Jon was invited by the band’s manager Don (Scoot McNairy) without consulting the band, so it isn’t until they arrive on stage that the other members realise Jon is playing with them. Jon, though nervous, is thrilled to be a part of the band and gives it his best, but the others are unimpressed. That is until, Jon receives a call from Don who tells him that Frank, the band’s enigmatic leader who wears a fake head all the time as part of his shtick, thinks Jon “has something” and wants him to be a part of the band. So Jon packs up and races off to a mountain retreat to immerse himself in music, and “reach his furthest corners”, something the other band members believe he is incapable of. Unbeknownst to the band, Jon then keeps a record of their carry-on’s digitally and posts it regularly to social media, and this gets them a gig at SXSW – something no one wants, except Frank, after Jon is able to talk him into it. Frank is no doubt a gifted musician, but he, and the others seem troubled in a deeper way, something the selfish Jon is sure will work itself out with fame. However, a darker issue lurks beneath the musical surface of Frank, and it is here that the talents shown in What Richard Did come to the fore, and give Frank the option of being a great film, if you want to look at it differently. Abrahamson’s Frank is also a lucid and startling contemporary take on mental illness, with a great deal to say about integration, and assimilation of those with mental illness in our community. 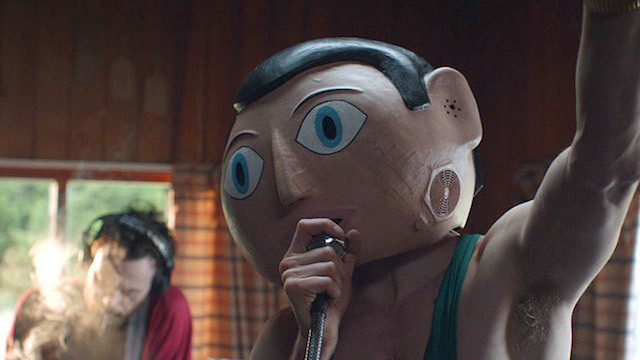 The true greatness of Frank as a film is its ability to translate the importance of acceptance outside of “normal” for those who will never be able to fit in. There is a broad sweep of understanding, and better than that, appreciation, for the mentally ill, but gifted individual, seen for their strengths rather than weaknesses. This is a powerful connection, that does tap into the world of outsider art and offers a strikingly optimistic possibility for a broadening of our public functions to include those with mental illness. 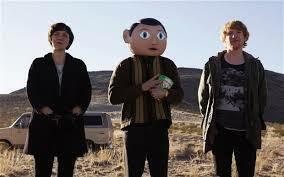 It is Abrahamson’s depiction of mental illness in Frank that makes this a great film, imbues it with all of its narrative arcs as well as taking us by surprise in character complexity. The only real problem with the film is with the sane person, who just doesn’t belong there. So that’s it from me. Frank is a little from column A and a little from column Z (see what I did there?) if you like – and its up to you. If you are passionate about outsider art or Frank Sidebottom, you might find this film too irritating and simplistic in its approach, not to mention suffering from the very conceits it tries to expose. However, as a film about mental illness, this is one of the best you will ever see.